The Marshland Radio Plumbing Project is an interdisciplinary project involving sculpture, photography, oral history, audio recording, electronics, performance, and site-specific interventions in the landscape related to geo-specific phenomena and folklore. This project focuses on a local phenomenon related to the Radio Canada International towers on the Tantramar marshes. Many Sackville residents report stories and rural-myths of household devices picking up and playing radio signals from the RCI towers. Telephones, televisions, light fixtures, refrigerators, toasters, sinks, and bathtubs, occasionally become unintentional radios. Older houses with copper piping sometimes catch the radio waves in the kitchen sink, as the copper piping acts as an antenna and the sink itself acts as a loud speaker. The theory and artistic exploration driving this project involves mass media and our personal relationship to invisible landscapes. Radio waves from cell phones, satelite TV, wireless internet, and AM/FM radio are penetrating our spaces and our bodies on a continual basis. Instead of focusing on the structure of transmitted messages, I am more interested in the unintentional witnesses. The unintentional listener is the silent subject of this project. In this project, I have attempted to recreate such a situation through building my own free-standing sink structure out of copper piping and metal plumbing components. I took my radio sink on location to various outdoor locations in view of the radio towers in an attempt to hear the radio from my sink. The public was invited to come out to see and hopefully hear the radio sink in the marshes. 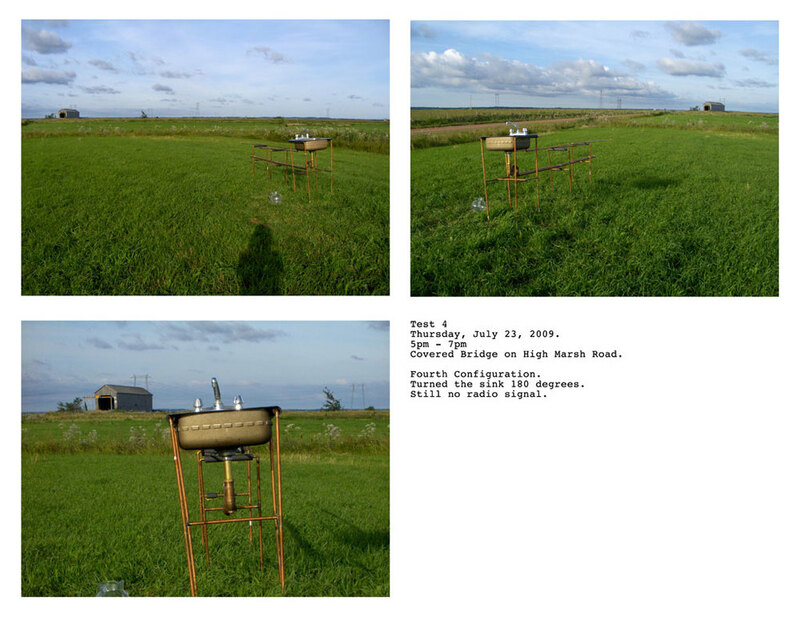 I photographed the sink in each location with the marshland landscape and the radio towers in the background, as well as recording video and audio at each location. A free standing sink built of copper plumbing and modeled after a fox hole radio schematic. Interviews with local residents about this phenomena and their personal radio experiences. Framed 16x20 photo montages. Each one has 3 images and a series of text detailing the test and results. A topographical map of the region, maps of the radio tower site, schedule of international broadcasts, formulae for calculating wavelengths (ergo antenna and copper pipe length), and radio schematics.